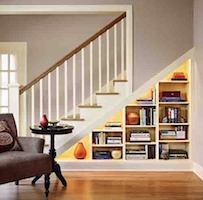 Wondering if there’s a way to make use of that empty space under your staircase? You can transform this overlooked area into a place for your pet to snooze, a cozy reading nook, a fun playhouse for the kids, and more! Get inspired by these creative ideas.Turn one of the least thought-about places in your home into one of the most interesting areas: the staircase! Are you running out of storage in your home? 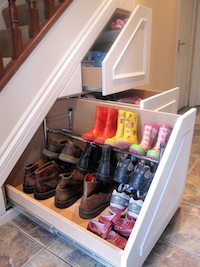 The area under your staircase can be the perfect place to fit shoes, coats, or even your junk drawer! By building cabinets that fit the look of your exterior wall (paint and design), your storage can be hidden from guests but easy enough for your kids to find. They can be built into different sizes, or can even be made into one large closet. Another great idea is a bookcase – we know books are collected over time, and people tend to run out of space for them since they weren’t planned for. An interesting way to both store the books in a safe place, but also use them as home décor is to build a bookcase where they will all fit (and everyone can see them). Do you love wine but your wine rack is running out of space? How about a wine “cellar” under the staircase? The wine will keep cool because it’s inside of a walled space, and it makes a great decoration and interesting conversation starter for the home! It can be elaborate with glass doors to open up to the wine, or it can be simple and just include the racks for the wine. Lastly, do you have a dog that needs her own space? 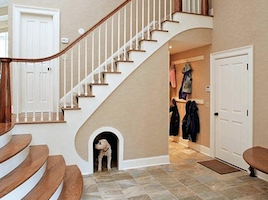 Consider turning your staircase into a doghouse! A great space for her to rest, chew a bone or spend time in when you’re out of the house, you’ll be your dog’s favorite human after converting this area into her new home. Just make sure she’s potty trained and knows to go outside! Inspired by any of these ideas, or want to think up more? Give us a call at (661) 799-8089 and let’s brainstorm!